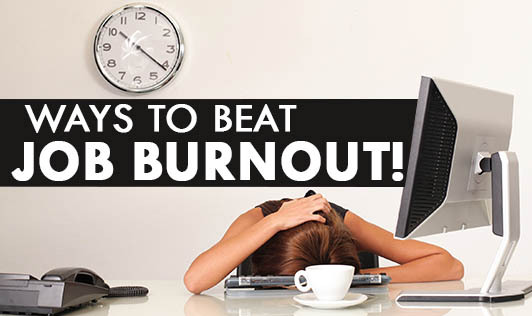 Ways to beat job burnout! Do you ever get this fruitless feeling? It may be a burnout. This is a state of severe exhaustion which is brought about from prolonged mental, physical and emotional stress. So, how do we eliminate this burnout beat? • Learn to say "NO": You're not a machine and you can only complete certain tasks within a given time. You are going to have to say "NO" to some people or tasks. Remember that it's better to do a good job with a few obligations rather than disappoint everyone with many obligations. • Reach out: Learn to trust people around you and ask for help. Delegate the work accordingly. Eliminate unnecessary tasks, stop multi-tasking and take strategic breaks. • Disconnect from technology: Try to set sometime aside in which you shut down all your gadgets and breathe! • Make a schedule: Make a schedule and stick to it. It's important that you take time out for yourself on weekends and unwind. • Eat, sleep and exercise: Eat a well balanced diet, get adequate amount of sleep and exercise. Sleep will keep you functional throughout the day, exercise will improve blood flow and keep you attentive and diet will keep your body more effective. • Be realistic about success: There's nothing wrong with having big dreams and ambitions but if you're constantly annoyed by a lack of progress, it might be time for you to step back and scrutinize your goals. • Take it slow: Everyone around you is telling you to rush things: "Make money quicker, retire sooner". While these things aren't necessarily bad, they can take a toll on you. Hence, if you're feeling burned out, it's time to slow down.